In my last article I tried to outline the strategy and your choices when implementing the new lease standard IFRS 16 Leases. I am grateful for many responses and comments I got from you. Almost all e-mails I received from you asked me to publish solved numerical example to see how to implement IFRS 16 in practice. Therefore, unlike in my other usual articles, this time I’ll solve one example with one specific lease contract for you. You might well know that the IFRS 16 affects mostly lessees who are involved in operating leases, because under the new rules they need to bring the assets from off-balance sheet to the daily light. In other words, they will no longer be permitted to book all rental expenses from operating leases in profit or loss, but they will need to recognize the lease liability and the right of use asset. Therefore, in this article, I illustrate the application of the full retrospective approach and modified retrospective approach to IFRS 16 adoption. Ready for the example? Here you go! ABC, the manufacturing company, needs to adopt the new standard IFRS 16 Leases in the reporting period ending 31 December 2019. During the preparatory works, ABC discovered that the operating lease contract related to a machine might require some adjustments. ABC entered into the contract on 1 January 2017 for 5 years, annual rental payments are CU 100 000 in arrears (that is, 31 December each year) and at the end of the lease term, the machine will be returned back to the lessor. The economic life of a machine is 10 years. How can ABC restate the contract under IFRS 16 using both full retrospective and modified retrospective approach? Use the discount rate of 3%. If you are a lessee, then be careful about the selection of the appropriate discount rate, because its definition in IAS 17 no longer applies. The initial direct costs of the lessor. This is very hard and sometimes unrealistic, because most lessors won’t share the unguaranteed residual values and their initial direct costs. Therefore, most lessees will need to use the incremental borrowing rate – that is, the rate at which they would be able to get the new borrowings for acquisition of the same asset with similar terms. This is quite judgmental, but at least it’s more realistic than asking your lessor for additional information in most cases. In this numerical example, let’s assume that given 3% is the ABC’s incremental borrowing rate. Before you start drafting your journal entries to adopt IFRS 16 and cease reporting the contract under IAS 17, you need to see clearly how you reported that contract under both sets of rules. Here, it’s very simple and straightforward: ABC accounted for all the lease payments from the operating lease directly in profit or loss. Under IFRS 16, ABC needs to recognize the right of use asset and the lease liability. The lease liability is calculated as all the lease payments not paid at the commencement date discounted by the interest rate implicit in the lease or incremental borrowing rate. Note: Discount factor in the first year is calculated as 1/((1+3%) to the power of year 1), etc. Fine, we have the lease liability. The right of use asset equals to the lease liability at the commencement date, plus lessee’s initial direct costs, plus some other things – but in this case, we have nothing like that, so let’s just say it’s the same as the lease liability. Depreciation of the ROU asset: Let’s say it’s straight line over the lease term of 5 years, thus it’s CU 91 594 per year (CU 457 971/5). Lease payments: Each lease payment of CU 100 000 is split between the repayment of the lease liability and interest. As you can see, total profit or loss impact of both IAS 17 and IFRS 16 application is the same CU 500 000, however, the timing is a bit different. So, now we have set everything and let’s see how to make adjustment in equity and how to present the restatement under both full and modified retrospective approaches. I described both approaches in this article, so I won’t repeat it here and let me focus on numbers. ABC adopts IFRS 16 in its financial statements for the year ending 31 December 2019, and that means that the transition date is 1 January 2018. We need to restate all numbers for the comparative period, too. I know, I know! No cash moved! Wait until we are done with this exercise. This is just to illustrate that in fact, you are reversing the “old entries” and then making the “new entries”. And why retained earnings and not profit or loss? Because you are making this entry on 1 January 2018 and at this date, all profit or loss accounts from 2017 were transferred to the retained earnings. Note: The numbers come from table 2 for the year 1 (2017). In reality, you would adjust in in 1 single entry, but I wanted to show the rationale behind, its breakdown and logic. The numbers come from table 2 for the year 2 (2018). OK, that’s for the entries and adjustments. In the financial statements for the year ended 31 December 2019, you apply the new IFRS 16 and also your comparatives need to be stated under the same rules – thus you need to book the above entries n. 1 and n.2 carefully. 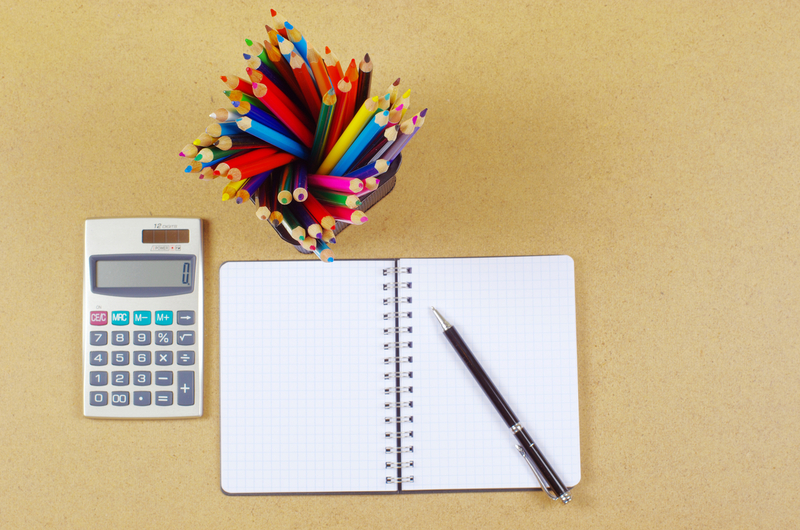 How would your financial statements look like? All the numbers related to the lease liability come from table 2 above. Now, let’s show the modified approach. Under the modified approach, ABC needs to make an equity adjustment on 1 January 2019 – that is at the beginning of the current reporting period. Comparative numbers remain the same as presented before – so no restatement. This is a way easier method to apply than the full retrospective approach, because you do not restate the previous years’ numbers. However, the price for this relief is lower comparability. It is quite difficult to compare current year under IFRS 16 with the previous year under IAS 17 and it does not say much about how your leases developed. Just see it for yourself in the below extracts from the financial statements. Before you jump into the journal entries, please note that I assumed the same discount rate at the date of application as original discount rate – just for the sake of this example, because thus I don’t need to recalculate the amounts from full approach. In reality, you need to measure the lease liability under modified retrospective approach as present value of the remaining lease payments discounted by the rate at the initial application. In this example, lease liability is effectively measured as present value of the remaining lease payments discounted by the original discount rate (as taken from above). Note: The numbers come from table 2 for the years 1 and 2 – you need to make a total for these 2 years (2017 and 2018). Note: Here, I measured the ROU asset as if IFRS 16 has always been applied – in this case, it was easier for me as I have already calculated all the numbers above. However, you can measure your ROU asset in the amount of the lease liability. This would be even easier, because you would not have to recalculate ROU asset in the past. You would simply calculate the lease liability (=present value of the remaining lease payments) and that’s it. What about the ABC’s financial statements? Please note that there are zeros for the comparative year 2018 – the reason is obvious. We are presenting the previous year under IAS 17 and there was no lease liability and right of use asset under IAS 17. This was just a basic example with a very simple and straightforward contract. 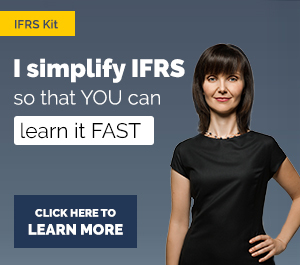 If you’d like to learn more about IFRS 16, its application, adoption and see many practical examples solved in Excel, then I recommend checking out my IFRS Kit – IFRS 16 is extensively covered! Let me know below – thanks! Currently there is operating lease for cars and after the end of lease term, cars are purchased directly by the employees from the lessor. No disposal in company financial statement is recorded. Now, the impact of IFRS 16 will be that cars will be assets of the company and in order to be transferred to employees after the lease period, disposal needs to be recorded in the financial statements. Is there any way in IFRS 16 that assets directly transferred to employees without disposal being recorded in the Company financial statements? under IFRS 16, the company will NOT have cars in its financial statements. Not at all. Instead, you will have ROU (right-of-use) asset to these cars in the financial statements. That’s slightly different. So, you will depreciate ROU to zero and then remove it from the financial statements as soon as the lease term is over. You can’t avoid it. Then when employees get the cars and the legal title passes to them from the lessor – it’s none of your business 🙂 S.
Very useful – thanks again! Thnak you for yrou great instruction on this topic. In this connection, would you mind telling us further how to derive the incremental borrowing rate in practical life? And are both methods, full retrospective and modfied ones, acceptable under the new IFRS? Thank you in deed for your understandable explanation. Is it right that under IFRS 16 operating lease is no longer exist, there is only finance lease? Hi Rasel, well, it is true that lessees do not classify leases anymore. 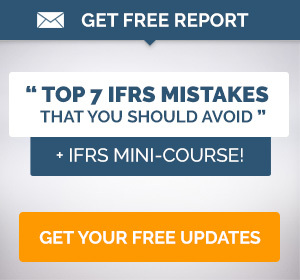 All the leases are accounted for in the same way (similarly as finance leases under IAS 17) – but there are some exceptions – please see How to adopt IFRS 16 Leases. Lessors classify leases into operating or finance. S.
Hi Silvia – the usual excellent, informative, well written/explained awesome article !!! ‘When you lease some assets under operating lease (as called by older IAS 17), in most cases, a lessor provides certain services to you, such as maintenance, repairs, cleaning, etc. Under older IAS 17, you did not need to think about it too much, because you put all lease payments as some rental expense to your profit or loss. Hi, under modified retrospective approach why you reversed previous year leases payments. In my point of view, lease liability/ROU Asset will simply be the PV of outstanding lease payments. Please clarify! well, the lease liability IS measured at PV of outstanding lease payments. It might not be clear from the first view, but I will clarify in the article – thank you. As for ROU, you can measure it in 2 ways – yours is one way, I measured it the second way – amount equal to the lease liability, adjusted by the amount of any prepaid or accrued lease payments relating to that lease recognised in the statement of financial position immediately before the date of initial application, because it was easier (I already had all those numbers). In my point of view, ROU Asset and Lease liability to be recognized for 282,861 as of 01-Jan-2019, while using modified approach. This is also called cumulative catch-up approach. Oh, I understand your point. You want to measure the ROU asset in the amount of the lease liability – yes, that’s an option, too. Another option is to measure ROU asset as if IFRS 16 has always been applied – that’s what I used. But it’s a good point and I’ll add it to the article – thank you. An amount equal to the lease liability adjusted for prepaid or accrued lease payments in the statement of financial position directly before the date of initial application. Yes, I think so in some cases. Many thanks for your prompt reply, but how is it ( impact in RE), if we calculate the BV for lease and the same amount for ROU assets as at translation date, and how can calculate the impact if i didn’t calculate it from commencement date. OK, so if you have a simple scenario, like your ROU equals exactly to lease liability, then I agree that the impact on retained earnings is zero. I’m studying for DipIFR from your post and IFRS Kit as well. Very easy to understand. Thank you very much. the rent contract for building & Land will be subject to IFRS 16 also(ROU) assets. We had as services provider a lot of agreemnets and contratcs in repsect of rent equipment and tools as well as manpower with sub-contractors. in the same time we had Rent contrcats for offices and land. so according to that, rent conracts of offices and land will be subject to IFRS 16 as well the manpower conracts. Dear Silvia M. thank you for helping us by doing numerical example on the lease IAS 17 and IFRS 16 for implement. Dear Silvia M. Could you help us on IAS 36 impairment of asset by doing numerical example on the recoverable amount or if you can, help me by doing numerical example on value in use For Cash Generating Units and single item. Thank you very much. Found clear and easy to understand as well as very useful. Hi Tu Tu, the lessor will keep recognizing it as before, because IFRS 16 has not changed much with regard to lessor’s accounting. S.
Hi. I can’t find any information online about leases provided for free indefinitely, in exchange for potentially having access to the client base of the company using the premises. Any help would be greatly appreciated. I would have thought that some income must be implied, perhaps at arms length? Many thanks. What happen if a company’s financial year end is 30 June 2019? Do we just adjust from Jan 2019? Hi Larry, no. You apply the IFRS 16 in the financial statements for the period that begins AFTER 1 January 2019 – that is, in your case, first time for the period 1 July 2019-30 June 2020. S.
Thanks a lot for your detailed illustration on IFRS 16. I would like to clarify how should we treat in your example, if we have paid a 100,000 (Altogether 200,000) in advance during the year 2018? Should we treat 100,000 as an advance payment in year 2018 and allocate it according to the table in 2019? Or, do we need to adjust the table to reflect the correct present value by adjusting the lease payment in 2018 from 100,000 to 200,000 (so that the liability b/f will be adjusted in year 2019)? Your guidance on this would be highly appreciated. Hi. This is a very informative article on IFRS 16. An entity (ABC) is a first time IFRS adopter in 2018 (i.e., it will issue first IFRS financial statements as of Dec 31, 2018). ABC intends to apply IFRS 15 from 2017 (which is actually effective from 2018), accordingly, can it also early adopt IFRS 16 in 2017? Suppose if ABC decides on modified retrospective approach under IFRS 16 then all the cumulative impacts would go to retained earnings as on 1 January 2017 (which is the opening balance sheet for the purposes of IFRS 1), right? In a similar way that all cumulative adjustments (entity adopts for cumulative catch-up basis) for IFRS 15 would go to retained earnings as on 1 Jan 2017. Yes, you can adopt IFRS 16 earlier if you adopt IFRS 15, too. 1. How do we treat rent free period in the lease liability calculation? 2. On the inception date, how do we treat the lease credit that is already in the balance sheet derived from from the rent free period (this was recorded in accordance with IAS 17)? as soon as the asset is available for use to the lessee, lessor starts recognizing the lease receivable. In rent-free period, no repayments of principal are recognized, just interest is charged. You should adjust the effective interest method accordingly. I have solved very detailed example on this in my IFRS Kit. S.
Please could you explain the second point that Perminerjeet has asked? 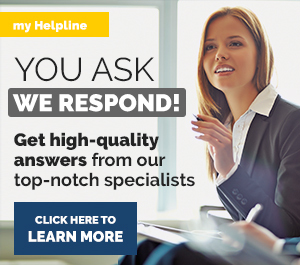 Dear Abby, the response is still the same – it is simply included within the effective interest method and leased liabilities. The IFRS Kit brings detailed example on this. I am sorry, it’s not possible to give a detailed response in the comment. Thank you for your understanding. Hi Silvia, are you referring to your example 4 – Var.payments? It’s a clear example but unfortunately I do not see the transition to IFRS 16 from a lease credit due to lease incentives under IAS 17. Is this lease credit transition reported in retained earnings? Hi I am just wondering do you need to use an inflation rate to get the FV of the lease payments before using the discount rate? No, you are taking current lease payments into account. Adjustments for the inflation are done when the lease payments are adjusted and it is treated as the lease remeasurement. I have solved few detailed examples on this in my IFRS Kit. S.
Hi, thank you for the simple explanation. I have one example I am unsure of, if a company has a lease term of 5 years and at the end the residual value is £50K. If the company chooses to keep the asset and buy outright do we depreciate over the remaining life or write off in current period? I have a query,regarding the same. if i take 30 year lease with monthly rental payment and escalation after every 3 yeras @ 10% on 01.01.2010. If i wanted to discount it @10% monthly compounding rate i will get the finance cost which is more than actual rental period at initail stage and didnt get cleared at the end? What will be the accounting treatment for the same i.e finance cost which is more than actual payment during initial stage. Thank you for this article. Could you help me to solve one issue. Take the scenario below. Restaurant company sign property lease contract as a leasee. And monthly rent is calculated as basis of actual sales revenue with no fixed rent or even fixed rent is too small compared with variable rent. Whether to recognize ROU asset or not if there is no fixed rent? If ROU asset should be recognized, what is the calculation logic? Looking forward your precious answers and comment! What if the rental of an office is for capital purposes? I mean, an area is rented for a group of people, providing a capital work (workers’s salaries are also capitalized). Do we need to use the IFRS 16, or capitalize the monthly payments as a part of the investment project? Or is there any other way to treat the Lease agreement. P.S. The contract is made for one year with an automated prolongation option for additional year if not cancelled. It’s been 3 years for now that the initial contract hasn’t been cancelled (so it’s prolonged). I publish weekly podcast with answered questions and the next week, I answer the question of capitalizing the rentals (episode n. 019). Maybe you should check that out. The short answer is no capitalizing. S.
Great Sharing. Thanks a lot. My Co. Rented a factory for 5 years and after 2 years passing making an infrastructure (child care) by own cost. So now can we considering the cost as lease Hold Improvements under IFRS 16? we want to amortize within 2 years equally. Is it possible? is the infrastructure firmly attached to the factory? In this case, I agree. S.
Yes its attached with the factory. Hi, could you help solve a difference of opinion please? If you have a lease with 34 quarterly payments, paid in advance, would you consider the lease term to be (and therefore the interest and depreciation to be spread over) 100 months, because the last payment is made in month 100, or 102 months? Many thanks for any help on this! I have reversed the prepayments by Dr RUA and Cr Prepayments and will depreciate RUA during the remaining period of lease. I have discounted PV of remaining lease payments (Which are payable during 2018 – 2020). Yes, I think so. You should reverse everything and then if you apply modified approach, just discount the remaining lease payments and it is equal to ROU at 1 Jan 2018 – it means you applied one of the practical expedients at transition. S.
If we have a large number of property that we have signed Property lease agreements: These lease would have been established prior to Jan 1, 2019. The payments are paid periodically and today these leases are treated as Rental Expense. Would we be required to recognize these leases under Right to Use (ROU) based on the PV of future lease payment obligation + any restoration costs that would be estimated? Would we need to identify each Property individually and add these to a category called ROU under the Fixed Assets or would we need to create a New Category within the Financial Statements? First of all thanks for such a rich answer. I have one question. How do you calculate Discount factor in year 2 (0,943)? I believe the answer is in the note right below the table, but let me repeat: it is 1 divided by ((1 plus 3%) to the power of 2). if you apply the practical expedient, it will give you the same effect. You can just calculate the lease liability on the lease as at 1 January 2019 as the present value of future lease payments and take this amount as your right of use asset. S.
If we have previously recognised a Dilapidation provision for our leased properties then should this be included in the ROU asset in accordance with IFRS 16. As a result, should the double entry be that we Dr ROU asset and Cr Retained earnings (i.e. adjustment through equity). Thank you. I have been able to follow this complex area based on your article(s) so WELL DONE. There was a tiny copy/paste error that threw me a bit in the “Modified….” section where you referred to Debit Retained earnings (equity): CU 183 188 (= interest) where it should read Debit Retained earnings (equity): CU 183 188 (= DEPRECIATION) but I was able to decipher that from the full model further above. Secondly in my Excel model I managed to calculate the discount factor as “=1/EXP(i*n)” it gives me some minor rounding errors but I think that is the right way to use that formula. Thanks again – very very comprehensive. Thanks for the article. This is easy to understand. Since property tax is part of the lease payment calculation in a gross lease, can you shed some light on how to deal with the annual property tax adjustment please? which components are included in deprecation of ROU? and next issue was raised , when I am going through contracts is CPI ? What about CPI if it is included in contract? I think that this is well covered in the IFRS Kit – please study the chapter about separating lease components from non-lease components (chapter 2 of IFRS 16). You have to do this right in the commencement of the lease and then you will treat each individual components in the same way. If you are a lessee, then you don’t even need to separate, but simply add everything up and treat it all as a lease (add up everything and see it as one payment). As for CPI – consumer price index (inflation) – this is also very well covered in the IFRS Kit. Please study chapter #7 of IFRS 16, you will see the exact numerical example with payments increased for inflation. S.
Hi Silvia, thank you for cool instruction. But at the same time, using Full retrospective approach, I can’t get the same amounts of BS.Retained earnings (equity) comparing movements of bookings with Statement described by you. Sorry, I can’t check how that could happen! Its been always helpful to consult your articles. I have one question regarding the leases. How to treat if the yearly lease payments are increasing with a fixed amount. the yearly rent is increased every 2 years. We will be more happy if Silvia answered it. Any fixed increment is part of lease payment should be considered now and discounted to obtain present value of lease liability. Any fixed increase should be added to calculate PV of lease liability. In your example, all each year’s payments including incremental to be discounted to get PV of lease liability. Nice article, with clear understanding of Recognition, Measurement, Presentation and Disclosures. Hi Sylvia, great article! I do have a question after reading the 2 approaches though, and that is since the Modified Retrospective Approach you used takes it as if IFRS116 was applied all along, then why can’t the figures from “Restatement of opening balances at 1 January 2019” be used in the 2018 column of the SFP and SCI? I noticed this as the journal entries would give the exact same result as the 2018 (restated) figures in SFP. The only issue here is SCI, since the Modified Approach would be combining 2 years of depreciation and interest instead of one year (since SCI is normally for an annual period). Could we just present the SCI figures in a separate disclosure under Notes to Financial Statements? Under the full restrospective method, is the 1-1-2018 (restated) compulsory? This example enlightened my understanding on the transitional provisions. Was wondering – If we were to measure the lease liability and ROU asset by computing the PV of lease payments as of 1 Jan 2019, does it mean that there is no need to restate the opening balances as at 1 Jan 2019? thank you! Yes, you do need to restate opening balances – these rules are just to simplify measurement for you. You need to restate the balances as described in the above example. S.
Was wondering- lease contract is made by a yearly basis, but we will rent it next year. Is it considered as short-term lease? Sandra, for this question, I recommend reading/listening to this Q&A session. S.
Most of the Lease contract under which payments are made normally in advance. Then at the date of initial what will be the treatment of Prepaid Asset. as I understood, under the simplified approach no entries to be made on 2018, it just one entry on the 1.1.2019 for transition purpose. is this correct? Thanks a lot for the clarification. My question is, is it practical to get an incremental borrowing rate for a property lease which goes beyond 30-50 years. Because no loans are given for such a period of time. Kindly clarify. What is the entry for the bank payment? is the below entry correct? Thanks a lot for this post and the clarification with an example. Quick question about the example. Let us assume that ifrs 16 was applied from 2017 on and that the lease concerns a car that gets wrecked in the second year beginning 2018. The difference is the 5 333 euro. On which account should this be corrected? I am not sure what you mean by ROI – maybe right of use asset? In general yes, if the lease is finished by wrecking of the car, then you remove the balance sheet carrying amounts and the difference is recognized in profit or loss. Thanks Silvia, Yes I meant ROU. Sorry for confusing you. How do you account for a period that is less than 1 year? Say that the last period in your example is 0,5 years. Then, in my calculations the sum of interest and depreciation does not equal the sum of lease payment. The difference is 1.489. Why is that? Quick question – what if the lease term for an asset, say vehicle (9 years lease) is longer the useful life of the asset per Company’s policy(7 years max) ? Would we depreciate the ROU per the lease term or per the company’s policy and have no depreciation charge for the last 2 years of the lease term? Thanks a lot for an easy to read article. I want to ask your advice regarding the lease of dedicated logistics warehouse, meaning that the warehouse will be used only for one customer. How should it to be treated. As far as I understood we would have to account this warehouse in our books based on the new rules and our customer will also have to account the warehouse in his books as well due to he will be the only one user. Is that correct or not? It looks like three times the same warehouse will be shown in different companies as an asset. Of course those companies do not consolidate their reporting but still. Not really clear how to treat this case. if there is a lease and you are the lessor, and the lease is operating from your point of view, then yes, the lessee will book right-of-use asset and lease liability, plus you keep warehouse in your books. It is asymetric accounting, but that is OK. Please bear in mind that you and your customer do not have the same asset in your books: you have a warehouse and your customer has the right to use that warehouse which is a bit different. All the best, S.
wonderful explanation. how can i account for a 1 year auto renovating lease contract, without a maturity date, what would be my approach? Thanks for the brilliant explanation. It would be greatly appreciated if you can help us with question below. How would the difference in the ROU be accounted for? Would be take the difference to the P&L? Thank you very much for clear explanation of IFRS16 components. Very much appreciated. If we as Lessor has given an asset (a Playground) on lease and the agreement states that we will get the sponsorship benefits only in return (i.e. no cash/bank transaction), I am not sure how will I record Lease Receivables in our books. Could you please provide me some guidance or a clue as to where I should look for answer. If you have a link to an example, would you please be kind enough to share it with me. Thanks for sharing this example – I have a question – the VAT should be included in the NPV of the Credit Lease liability if the company is VAT registerd and if the company is not VAT registered? Also all the direct expenses, legal fees etc should be included with VAT or not? anything that you will get back from your government – do not include. Anything that you will not get back – include. This is a very simple rule, but it works. Thanks for your reply, one confusing thing more -since Lease Liaiblity and ROU based on cash – this means that if the rent agreement starts 2018 but we only need to start paying 2019, we do not recognise anything in 2018? no need for restatement of opening bal? No, that’s not the case. You need to recognize the lease liability and ROU at the inception of the lease – when the asset is made available to the lessee (in 2018). Hi Sylvia, i wanted to know if IFRS 16 applies to a rent agreement on a building for a 2yr period? i had a building rented in 2018 for office space but i signed a rent agreement for 2 yrs and not a lease agreement. I have a question about Full retrospective approach >Journal entry 2. Restatement of the comparative period (year 2018). The entries for Interest, Depreciation and Operating lease expenses are made in “P/L 2018”. Is this correct? Hi Matt, yes of course. I intentionally made entries as to “P/L 2018”, because you are applying full approach and you need to show restated numbers for 2018, too – so you must prepare the numbers for 2018 under the new IFRS 16, too and made bookings somehow there (although maybe not in a real time). S.
I thank you for your promt response. I am glad I got the example/entries right. I agree with you that the entries have to be made in a way so that the numberst for 2018 will be restated, although in my opinion it would be wise to add a note in the example that the reference to “P/L 2018” relates only to comparative data – i.e. as the year 2018 is alrealdy closed, the entry (which takes place in 2019) is booked to “Retained earnings in equity”. I complement you on your articles They helped me a lot in understaning the main/key points of IAS/IFRS. If my reporting date is 30th April 2019….so my restrospective date of transition would be 1 May 2017? And what would be the accounting treatment for tax paid to the City of London? Hi Margaret, the transition date is 1 May 2017. As for the tax – well, I am not from UK, so I have no idea what the purpose of tax is and what the base of its calculation is – thus I cannot really say. S.
Hi Sylvia …tq for the reply…for retrospective application for YE 30th April 2019 – the transition date is 1 May 2017……but its applicable if entity also applies IFRS 15 under early adoption right? You have problem with one point. I know we need to adopt this IFRS at 1.1.2019. But my client has financial year at 31 March 2019 (not 31 December 2019), Please confirm if we can adjust the journal entry at 1 Jan 2019 to April 2019 or not. If yes, please let me know if where the rule say this point. Thank you a lot for your help. this standard is mandatorily applicable for the periods starting on or after 1 January 2019. It means that if the financial year ended 31 March 2019, it started on 1 April 2018 – isn’t it? In this case, your client can still apply IAS 17 for the full financial year and then apply IFRS 16 starting 1 April 2019. Hope this helps. S.
I have a problem with determining incremental borrowing rate. Could you please help how we can calculate this? Thanks in advance. Hi Silvia, very grateful for the work you are doing. was wondering if you can address the impact of ifrs16 on the cash flow statements. where would you record the change for the ROUA and lease liability? my apologies if you have already addressed it in another area. Thanks in advance. 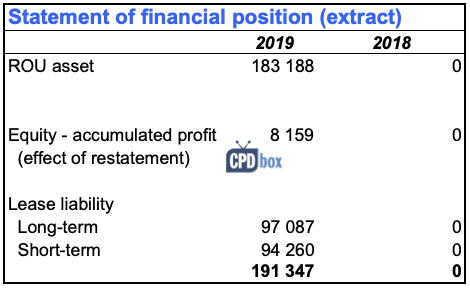 Credit Operating lease expenses (profit or loss of 2019): 100 000- Shouldn’t this last line be Credit Bank 100,000 for the amount paid in Year 3? I guess no, because this entry assumes you have already booked something according to IAS 17 and this is just restatement of what you have booked.